The Anatomy of a Patient Centered Medical Home: the Physiology of an ACO? Posted byAdmin	 November 14, 2012 Leave a comment on The Anatomy of a Patient Centered Medical Home: the Physiology of an ACO? Just like Obamacare is not something invented by overzealous socialists, but the brainchild of extremely conservative thinking, the PCMH is not a government invention, but instead it is based on a statement made by physician associations attempting to define good primary care and the need for insurers to pay more for such excellence. The devil of course is in the details. It’s been said that the “official” NCQA PCMH requirements consist of too many details, and that some of those details are bureaucratic in nature, burdensome, expensive and contribute little to patient care. It’s been said that true quality of care and practice transformation, whatever that may be, is largely independent of counting points, formal testing, certifications and recognition’s Granted, all these contentions seem reasonable, but before deciding to walk away, how about a quick bird’s eye tour of what NCQA PCMH recognition really is? Standard #1 – Enhance Access and Continuity – Continuity here refers to people having a personal physician instead of seeing whoever happens to have time that day. I don’t know many practices where this is not the case anyway, but it’s hard to argue against the need to build a long term relationship between patients and their doctors, and it’s even harder to argue against this being the #1 foundational requirement of delivering high quality longitudinal patient care. Note that by definition solo practices are automatically set up to care for patients this way (just saying…). The second part of this Standard is a bit more problematic from a physician’s point of view, because it does require availability after hours and seeing patients the same day as much as possible. It is not an easy task to start tinkering with your schedule, if you are not currently offering same-day appointments, and done haphazardly, it may have serious financial implications to your practice. How about being available after hours, particularly for a solo or very small practice? How about your family and personal life? If you are one of the new concierge docs with a tiny panel of well-behaved patients, this is obviously not an issue. If you have 2500 patients, or so, on your panel, some creative thinking may be required. How would your patients react if, say, every Tuesday you’d start seeing patients from 12 pm to 8 pm? Or if you closed early on Wednesdays and twice a month you saw patients on Saturday mornings? Or if you had an arrangement with a couple of other practices to provide urgent care at odd hours on a rotating basis? Standard #2 – Identify and Manage Patient Populations – This one sounds onerous and a departure from individualized patient care, but is it really so? The “populations” term notwithstanding, all this Standard requires is that you document patient demographics and clinical information in the chart (seriously? ), that you take good histories and that you send reminders to your patients to mind their chronic and/or preventive care needs. There is really nothing here that a good primary care physician doesn’t already do, and probably to a much greater extent than the NCQA standards specify. The one thing that may be different is that this Standard talks about proactive reminders to patients that don’t come in to see you on their own. Good for business and definitely good for patient care on an individual level. Standard #3 – Plan and Manage Care – Another statement of the obvious, but this standard uses terminology that may raise some eyebrows. For example, it asks that your care is evidence-based. Is your care not evidence-based? Surely you decide how to treat patients based on your education, what you learned along the years, books, articles and latest research, instead of throwing darts at a random treatments list hanging in your office. And this is really all there is to this Standard, other than practicing medicine, i.e. seeing patients, evaluating conditions, planning care, talking to patients, and generally speaking, being their doctor. Standard #4 – Provide Self-Care Support and Community Resources – This may sound like the new age fluff of patients taking care of themselves, and granted, there is some of that here, but the details are again pretty straightforward in their intent to have patients understand their conditions and do something about it. Primary care docs don’t usually fit the much publicized portrait of aloof and paternalistic doctors who won’t give you the time of day. It is the time constraints in fully loaded practices that may prevent some from fully engaging with their patients, and no certification process will change that without proper shift in reimbursement, or a change to a more direct practice model with smaller patient panels. This Standard’s feasibility is also highly dependent on patients themselves, but there are simple things you and your staff can do to better enable patients to take some responsibility for their own health (most of which you are probably doing already), and this is all this Standard is about. Standard #5 – Track and Coordinate Care – Do you send patients to specialists and then forget all about them? Do you order lab tests and don’t care if the results come in or not or if they are normal or not? Do you get calls from the hospital notifying you that one of your patients was admitted, and you hang up thinking that this is not your problem? No? Then you are tracking and coordinating care. Can you do more? Probably, but here you are largely at the mercy of specialists and hospitals in particular. You most likely already have tickler lists to help remind your staff about getting specialists notes and test results, but it is extremely difficult to have the hospital contact you if you are not admitting your own patients (and sometimes even if you do). There is effort (and costs) involved in better tracking and better coordination and payers are starting to take notice as evidenced by the latest care coordination CPTs added to the Medicare physician fee schedule. Standard #6 – Measure and Improve Performance – Here it is. This is the measuring, reporting and all administrating bag of requirements, complete with patient satisfaction surveys, sending data to payers and using electronic medical records. 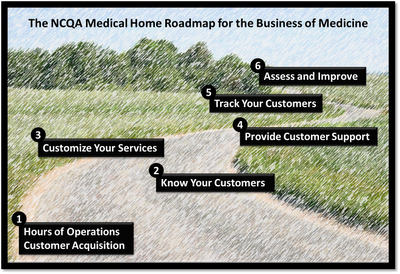 While most items here are optional, a medical home is required to set some improvement goals for clinical measures (just goal setting, not necessarily outcomes). So after doing everything outlined in previous Standards, this is where the assumption is implicitly made that a medical home should be able to continuously improve the care it provides. Perhaps you believe that you are already providing excellent care, and no doubt most of you do, but is there anything more you can do? This Standard is asking you to consider this question, and if you have an answer, begin acting on it. And yes, this too may take more time and more effort on your part, and thus be dependent on payments to support these efforts. Margalit Gur-Arie is a partner at BizMed, and formerly Sr. Vice President Operations at Physician Advantage (GenesysMD). She publishes ‘On Healthcare Technology‘ and tweets via @margalitgurarie. ACOs, ‘HMO lite’ or ‘DNA of the Transformation’?